There's no time to be shocked by the truth. The coroner's report proves that he had salt water in his lungs when he was killed. Just take my word for it, all right? Now, I want to know how it happened, and I want to know why, and I want to know before Escobar gets here because I don't want to lose my license...I want to make it easy for ya. You were jealous. You had a fight. He fell. He hit his head. It was an accident but his girl is a witness. So you had to shut her up. You don't have the guts to harm her, but you got the money to keep her mouth shut. He desperately and insistently wants her to tell the truth and neatly wrap up the case - he is determined that she confess the identity of the blonde girl that she has been sheltering, reiterating: "There's no time to be shocked by the truth." He also probably suspects that Evelyn may be plotting to murder the girl. She accuses him of having a "crazy" and "most insane" idea. Jake: Who is she? And don't give me that crap about your sister, because you don't have a sister. Her revelation is startling and unexpected - he is the one who is "shocked by the truth." The terrible truth of unimaginable evil is that Mrs. Mulwray had incestuous relations with her father, Noah Cross. Hollis Mulwray's "mistress" was, in fact, the offspring of their earlier liaison. This fact is indirectly related to the water department, the land (San Fernando Valley) swindle or water conspiracy, the building of the new reservoir, the corrupt money, Hollis' murder, and Gittes' setup. Mrs. Mulwray: I ran away. Mrs. Mulwray: Hollis came and took care of me. I couldn't see her. I was fifteen. I-I wanted to, but I couldn't. Then, now I want to be with her. I want to take care of her. Jake: Where are you gonna take her now? Mrs. Mulwray: Back to Mexico. The struggle over the girl directly led Cross to murder Hollis Mulwray. Hollis and Evelyn were trying to protect the innocent girl from her incestuous father, who has now extended his grasping reach toward her. Katherine is brought down the stairs to meet Jake: "Katherine, say hello to Mr. Gittes." Jake tells Mrs. Mulwray that he knows where they are going in Chinatown: "Sure." He lowers the front window's bamboo shade as he watches them leave from the front of the street. He then calls colleagues Duffy and Walsh to meet him at the Chinatown address in about two hours if they haven't heard from him. After Escobar and Loach arrive at the house, Jake is able to elude them by leading them to Curly's home in San Pedro where he alleges that Evelyn is hiding. He interrupts their dinner - Curly's wife (Elizabeth Harding) answers the door - with a bruised black eye from a beating by her husband for her adultery. Gittes convinces his fisherman/client to drive him away in his truck parked in the alley (this is the truck that Curly proposed selling to pay the detective's fee). In exchange for his previous investigative services, he suggests that Curly provide safe passage that night for Evelyn and Katherine (and their luggage) by smuggling them from Los Angeles to Ensenada. They will be waiting for him there in Chinatown. Cocky as always about his plan, Gittes assures a wary Curly: "Do you know how long I've been in this business?" For his final showdown with Cross, Gittes calls him and arranges a meeting at the Mulwray mansion - the scene of the crime - and he baits him: "Have you got your checkbook handy, Mr. Cross? I've got the girl." Gittes also possesses what he believes provides clear evidence of who murdered Mulwray - the camera pans down to Cross' pair of smashed bifocals that were fished out of the pond - they sit on the table by the phone. Cross has brought Mulvihill with him, with a gun pointed at the detective's head. At Cross' urging, the incriminating evidence - the glasses - are confiscated and Gittes reluctantly leads them to Chinatown to the girl. 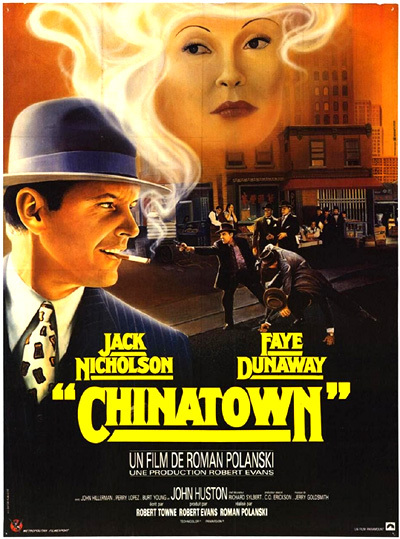 In the startling and despairing ending scene, the only scene in the film that actually takes place in Chinatown, all the characters converge including the unsuspecting police (on Cross' payroll: "He owns the police"). The sequence opens in the circumscribed area beyond true police and governmental control with passing views of neon-lighted Chinese restaurants and colorful lanterns, accompanied by discordant, blaring piano chords and a snare drum. Gittes notices that his operatives Walsh and Duffy have already been handcuffed. He appears willing to escape from Cross and holds out his hand to be cuffed by Escobar's partner, Loach, "for withholding evidence, extortion, accessory after the fact." But Gittes' protests are ignored when he argues, powerlessly, that Cross, Evelyn's incestuous father, is "the bird you're after...He's crazy, Lou. He killed Mulwray because of the water thing...Lou, you don't know what's going on here, I'm tellin' ya." Cross: Evelyn, pleeease, pleeease be reasonable...How many years have I got? She's mine too? Evelyn: She's never going to know that. With that, Evelyn pulls out a small pistol and threatens her father. Gittes suggests letting the police handle everything, but she replies with futility: "He owns the police." Cross tries to reason with her and accuses her of being neurotic and paranoid: "Evelyn, you're a disturbed woman, you cannot hope to provide...You'll have to kill me first." And with that, she wounds her father in the arm in full view of everyone, and then attempts to escape by car with Katherine. In the gripping final scene, Escobar fires his pistol twice into the air as a warning, and then once at the car's tires. Loach, still handcuffed to Gittes, takes three more shots at the escaping car as it recedes out of view - and one of his shots is fatal. Suddenly the car slows to a stop in the far distance. The blaring horn of the car signals a death for Jake. [The horn also sounded when Evelyn's head fell forward onto the car's wheel outside the house where Katherine was being kept.] There are Katherine's screams, as the awful, horrible scene is revealed - slumped over the wheel of her car is Evelyn, shot through the head from behind. Gittes is the first to get to the car - he opens the driver's door and she flops to the side. Her face is horribly blown apart through her flawed eye - she has literally been destroyed by her father. Escobar has the cuffs removed from Gittes' arms when he orders: "Turn them all loose." Cross, lamenting "Lord, Oh Lord," clumsily shields and covers the eyes of an hysterical Katherine - telling her "Don't look, don't look" - to prevent her from comprehending the enormous tragedy. The domineering, capitalistic water tycoon and controlling father/grandfather comforts her and ends up taking her away. Powerless to prevent the inevitable tragedy that he has exposed, Jake is stunned, shocked, and numb -- and cannot help but recognize (and see) the part he played in it. He is filmed in stark profile from the left, accentuating the stitches on his wounded nose. With Jake's last words, he mumbles what he told Evelyn he used to do in Chinatown and has again succeeded in doing: "As little as possible." His meddling into the mystery, and his emotional involvement in this case has led to a chaotic finale, where he is left to repeat past history in the dark streets of Chinatown. What's that? What's that? You want to do your partner a big favor? (To his men) Take him home. Take him home! Just get him the hell out of here. (To Jake) Go home, Jake. (Whispering) I'm doing you a favor. Forget it, Jake. It's Chinatown! All right. Come on, clear the area. On the sidewalk. On the sidewalk, get off the street.